This mixed habitat offers a variety of shelter choices for different beneficial insects. Butterflys like a safe place to hibernate and seek protection from the elements. Ladybugs like the areas with leaves and sticks to climb on during winter months. Bees are preferred for their invaluable service as pollinators. They prefer the tubes and cavaties. 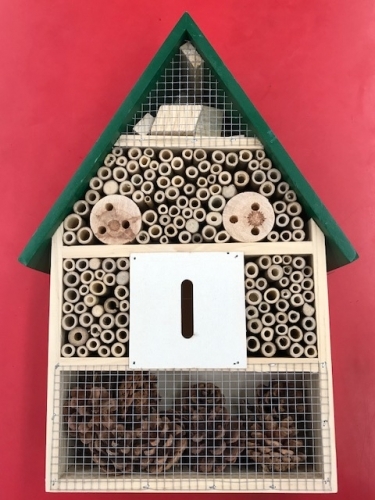 Simply place this hibernation habitat in or near your garden among plants to create a safe, sheltered enviroment for these beneficial insects. 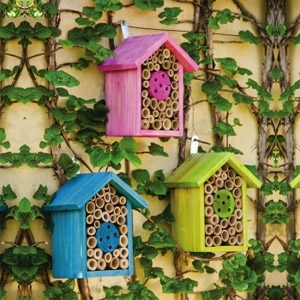 Welcome the Bees to your garden with these cozy little bee homes! This model is a mix between two bee style homes: a bundle of sticks, and a wood block model. Bees are the BEST pollinators and their hard work is sure to improve your plant’s health and make them more bountiful and beautiful.